Freemasons within the Warrington Group have again donated large sums of monies to Masonic and non-Masonic charities within the locality. Truly astounding donations demonstrated the generosity of Freemasonry continuing in the Warrington area. This was amply confirmed at a recent annual charity giving day at Warrington Masonic Hall. Over £27,000 was distributed to local and national charities, good causes and projects. Picture addressing the audience, are: Left: Andy Barton. Centre: Kevin Poynton. Right: Glen Screeton. Andy Barton, the Warrington Group Chairman, opened the giving day by welcoming all the visitors present, especially the principal guests, the Deputy Mayor of Warrington, Cllr Wendy Johnson, accompanied by her Deputy Consort Beverly Hallam, Local MP Faisal Rashid, Assistant Provincial Grand Master Kevin Poynton, Second Provincial Grand Principal Barry Jameson and Assistant to the Provincial Grand Principals Colin Rowling. After welcoming all the guests, Andy continues by saying how delighted he was to have them present to witness the support offered by the group, for local charities and good causes. Andy continued by introducing the group officials, Chris Gleave, group vice chairman, John McIntyre, group secretary and Glen Screeton, group charity steward. He then briefly explained that Freemasons are one of the largest contributors to non-Masonic charities. The causes supported range from international disaster relief, national charities, hospices and important local community-based projects and charities. 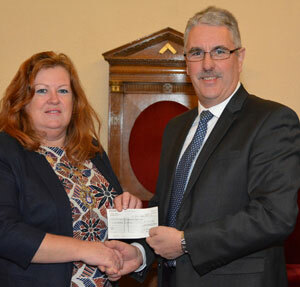 Cllr Wendy Johnson being presented with the donation from Andy Barton. Andy explained that three sauces of donations are provided, either directly from local groups and lodges, through our own West Lancashire Freemasons’ Charity or through our national Masonic charities. Soldiers, Sailors and Airmen’s Families Association (SSAFA), St Elphin Church, St Thomas’ Church, St Rocco’s Hospice, DKMS (Blood Cancer Charity), National Autistic Society, Ronald McDonald House, Zoe’s Place, Cavell Nurse’s Trust, Cruse Bereavement Care, Adam Lewis Effect Foundation, Northwest Air Ambulance, Brainwave, Room at the Inn, Warrington Talking Newspaper, The Salvation Army and the Walton Lea Project, just to name a few of the local charities and causes receiving support. 24 further organisations also benefitted with minor grants in 2018. In total approximately £12,000 was donated to non-Masonic charities. Masonic charities were also supported by donations of approximately £16,000 which were in support of Masonic Charitable Foundation, West Lancashire Freemasons’ Charity, Masonic Trust for Girls and Boys, Ecclesholme, (Masonic Care Home Eccles). A large proportion of these charities will support many non-Masonic charities including medical research grants, hospices, disaster and emergency relief funds just to name a few. Cllr Wendy Johnson, Deputy Mayor of Warrington, thanked the group for the support of the Mayor’s own charities saying how grateful she was to receive the financial help towards the Mayor’s year in office. She continued by saying she had learned a lot regarding the incredible amount of support offered by the Freemasons in Warrington and was amazed how much support was offered to the locality. Responses from recipients, are: Left picture: Faisal Rashid. Centre: Kate Davies. Right: Vanessa Storey. Faisal Rashid MP, thanked Andy for the group’s support for local charities, expressing his thoughts that the donations received would make a considerable difference to the recipients and their charities. He added this generous support is extremely important to the locality and the work undertaken by the charities. Kate Davies, representing Ronald McDonald House, provided a moving example of some of the work they undertake. She gave thanks to Andy for the group’s support. Vanessa Storey spoke on behalf of St Rocco’s Hospice. She briefly and very informatively explained how the donations would be applied to benefit the patients. She said that the hospice movement depends on such donations and thanked the group for their continued support.